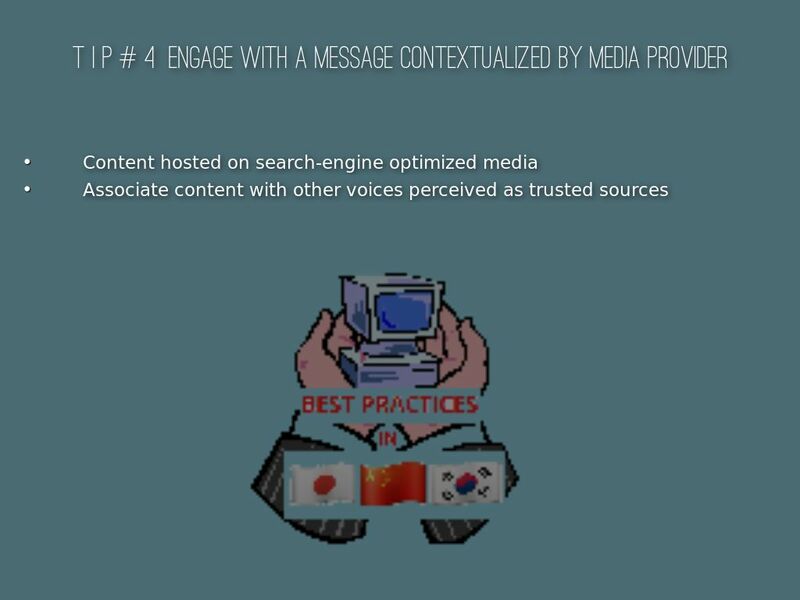 (Synopsis): North American educational institutions and tourism establishments must look for a better understanding of the online experience by student and tourist prospects of Northeast Asian origin by making content and advertising decisions beyond Lead Attribution Models. Last ­Click Measurement and Multi-Channel Funnels reporting through Search Engine Analytics play less of a role in predicting success (like driving conversions) when engaging with prospects traced digitally through a complex conversion path. Using the A.I.D.A. formula of events as an analytical framework, the author provides Ten Tips to be found earlier online in Japanese, Chinese and Korean. 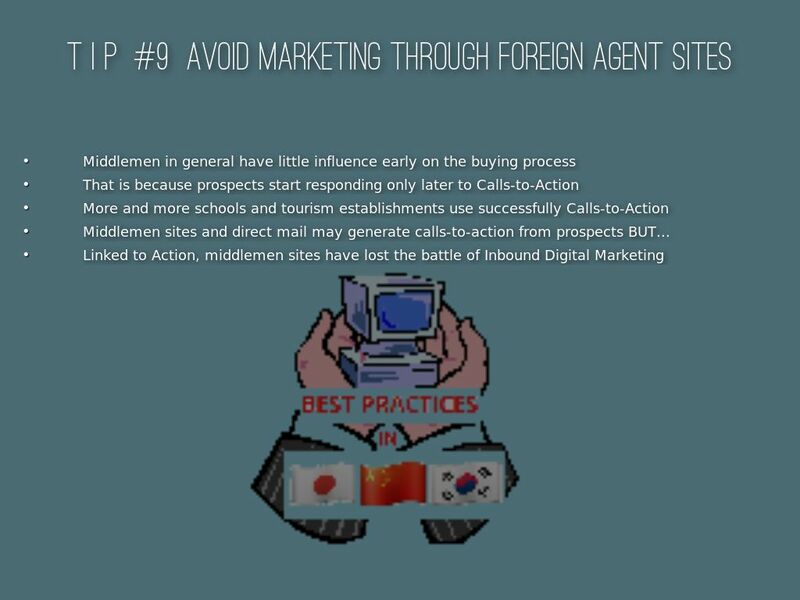 Ten Tips for North American establishments involved in International Student Recruitment or to attract tourists in Japanese, Chinese and Korean. 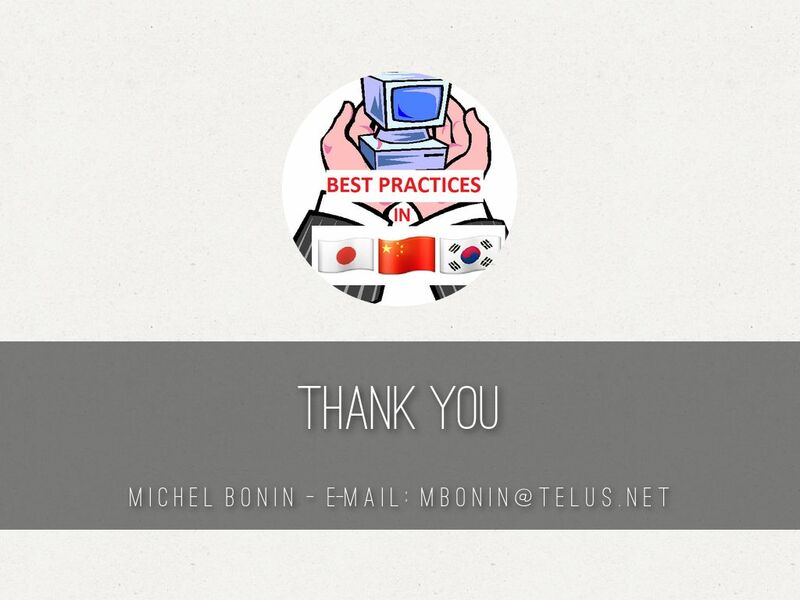 The author, Michel Bonin, Digital Marketing Researcher specializing in Northeast Asia, uses the A.I.D.A. formula of events as an analytical framework. Over a full cycle of A.I.D.A. 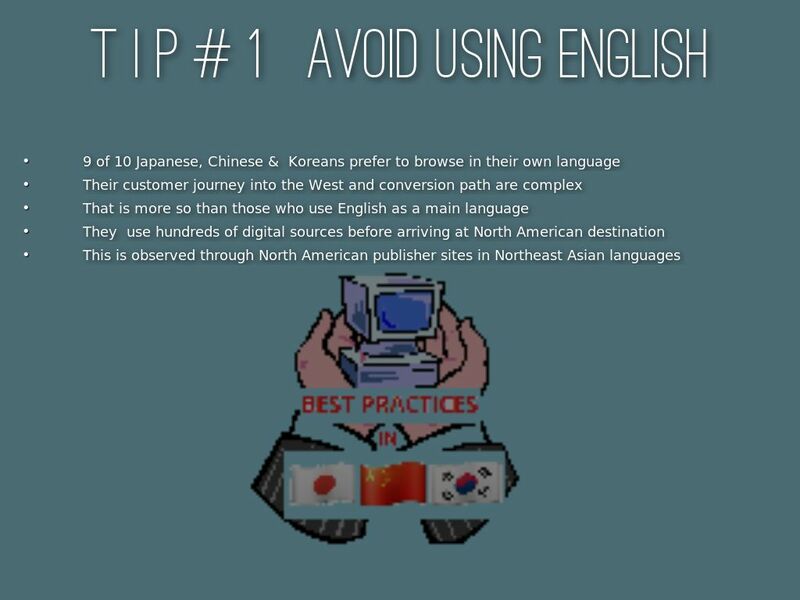 (Awareness, Interest, Desire, Action), surfers in Japanese, Chinese or Korean may use dozens if not hundreds of digital sources before arriving at their North American destination. Most prefer to browse in their own language 87% to 92% of the time. Their customer journey into the West and conversion path are complex, more than those who use English as a main language. This is being observed through traditional North American publisher sites with travel and education content in Northeast Asian languages. Early on their online journey, students and tourists of Northeast Asian origin begin by accessing through search engines some generic resources (Wikipedia-like) and directories. 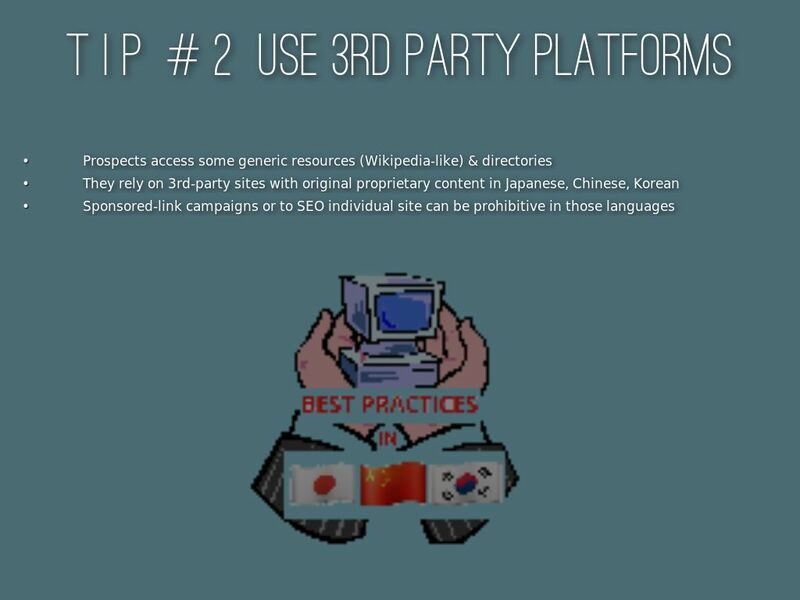 They often rely on third-party sites with original proprietary content. 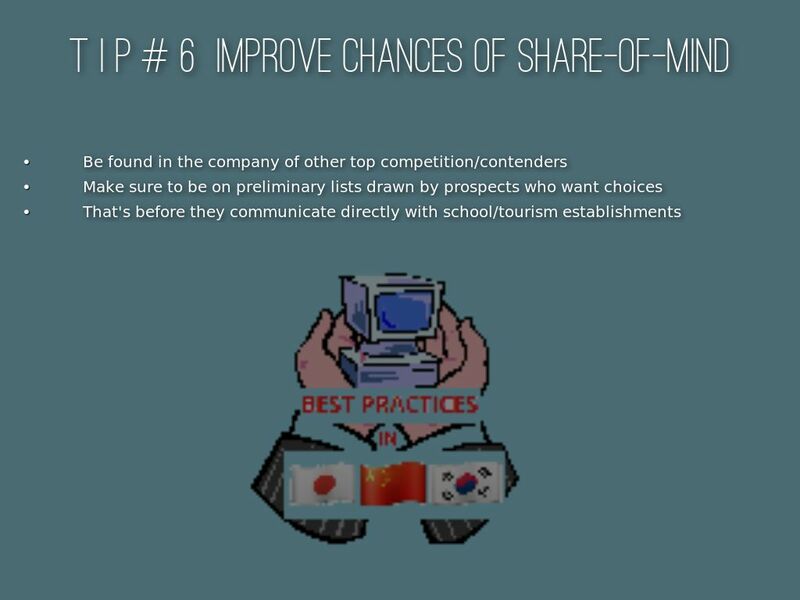 Except perhaps for the TOP 100 North American schools, tourism establishments & destinations, others should stay away from trying to optimize their own individual site to attract oversea traffic from Japan, South Korea and particularly China. Given world-wide competition tapping such economic powerhouses & gatekeepers concentration of digital traffic, they are among the most expansive in the world and least efficient. Sponsored link campaigns are over-bid on popular student and tourism keywords. When still in Northeast Asia, the focus online is generally to raise prospects' Attention and Interest. 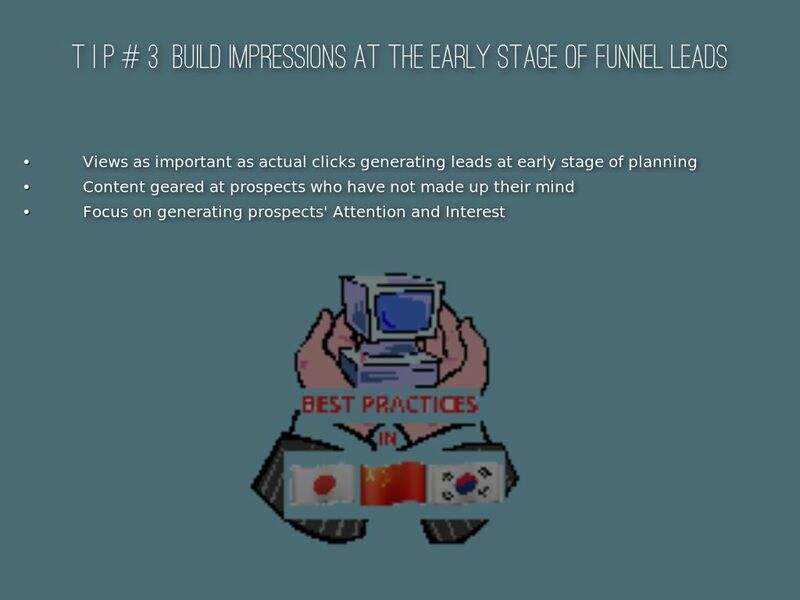 That is because impressions (view throughs) is often as important as actual clicks in generating leads at the early stage of planning their oversea studies or travel. That is well before prospects may have made up their mind on which particular school(s) and program(s) or tourism establishments they Desire to contact and apply to by taking Action. At such early stages of Attention and Interest, make sure that digital content through listing and advertising with display banners are hosted on third-party sites or social media hang-outs entirely dedicated to provide content search-engine optimized in a language that prospects are most familiar with. - therefore allowing bookmarking of a specific page that will have raised the Interest while entirely dedicated to an individual school or tourism establishment. At such early stages, prospects of Northeast Asian origin will first browse, often systematically, to establish a preliminary list of potential countries, programs, schools, tourism establishments where to eventually visit, apply to, etc. That is well before they communicate directly with schools or tourism establishments or in many cases, some middlemen (ie. agents) or through those rare events like education or tourism fairs that may occur near their homes in Northeast Asia. The no direct click phenomenon largely explains why when asked to list or rank the tools used to plan their studies or travel, that is once they have arrived and started their studies or holidays at a North American destination, most actual students/tourists cannot recall accurately (aided or unaided) which sites and social media they first came across a listed school or tourism establishment. 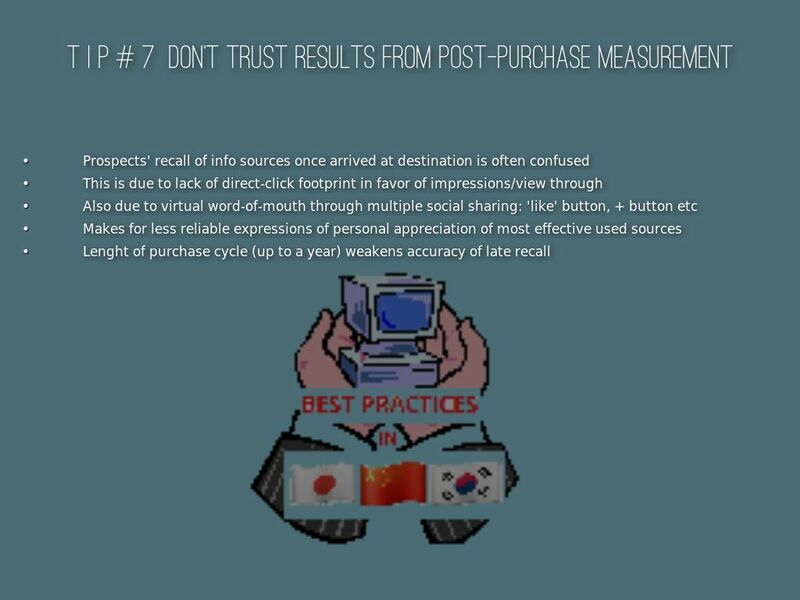 The quantity of virtual word-of-mouth through multiple social sharing, such as clicks on 'Weibo like button', 'Google+ Japan button', etc, added to bookmarking, makes for less reliable expressions of personal appreciation through a simple recall of used sources. Through the prospects' journey, more than half of them browsing through online directories show an IP address located outside North America; that is mostly from Japan, Mainland China, Hong Kong, Taiwan and South Korea. Therefore the importance to use content marketing through directory or advertise like display banner ads on third-party publisher sites that do not essentially rely on surfers located in the diasporas of prospects of Northeast Asian origin already living, visiting or studying in North America. Contact through school or travel agents' sites are a lesser factor than third-party online directories by traditional publisher sites and social media content in influencing the buying process at the early stage of the lead generation funnel. Only at a later stage of their planning, will most prospects start responding to Calls-to-Action, sometimes from agents' sites or direct emails but increasingly from schools and tourism establishments themselves that use Inbound Digital Marketing strategies. Agents' digital footprint may show up later at the Desire stage of the A.I.D.A. cycle. Closely linked to Action, their sites are gradually losing the battle of inbound digital marketing to the hundreds of multinational web platforms dedicated to the planning in Japanese, Korean and Chinese (eLong et al) of trips and studies. Many Interactive Agencies and SEO specialists have become advocates for a major platform or another. They tend to depend at the roots of their analysis on dominant Search Engines Analytics, at best an incomplete and at worse, a faulty metrics indicator of early lead generation into the funnels. 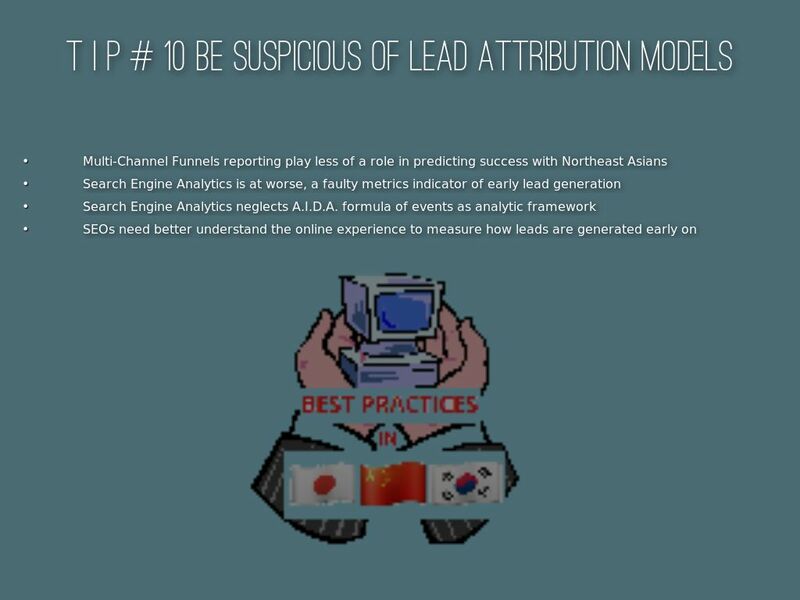 Lead Attribution Models, Last ­Click Measurement and Multi-Channel Funnels reporting through Search Engine Analytics play less of a role in predicting success (like driving conversions) when engaging with prospects traced digitally through a complex conversion path. 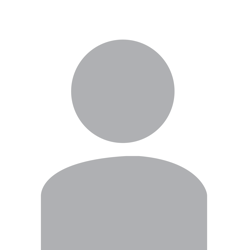 Exclusive digital ad sales agent based in Vancouver, BC, Canada, Michel Bonin has helped since 1999 North American educational institutions, Canadian tourism establishments and destinations engage and be found by prospects of Northeast Asian origin. international students, leisure and business travelers of Northeast Asian origin.